What Causes Those Red Bumps? 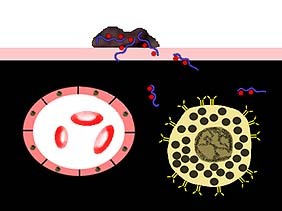 Just under our skin are capillaries carrying blood with its circulating red cells ( ) and a variety of white blood cell types. Just outside of the capillaries, in the tissue of the dermis, lurk specialized immune cells called MAST CELLS. When we get itchy red bumps on our skin from contact with an "allergen", it is due to how our mast cells respond to the allergen. 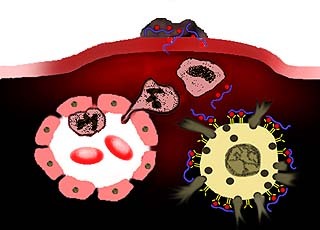 Mast cells are covered with molecules of Immunoglobulin E antibody (IgE, ). There are antigens ( ) in dust mites, in their droppings ( ) and shed exoskeletons. Once these antigens get under the skin of an allergic host, the antigens cause mast cells to go berserk, releasing histamine which leads to localized leakage of fluid from capillaries, hence the itchy red bumps.